There are cases where you need to change the IDs of your employees. For example, an employee that changes department, an employee who is transferred to other branch or an employee who gets promoted. 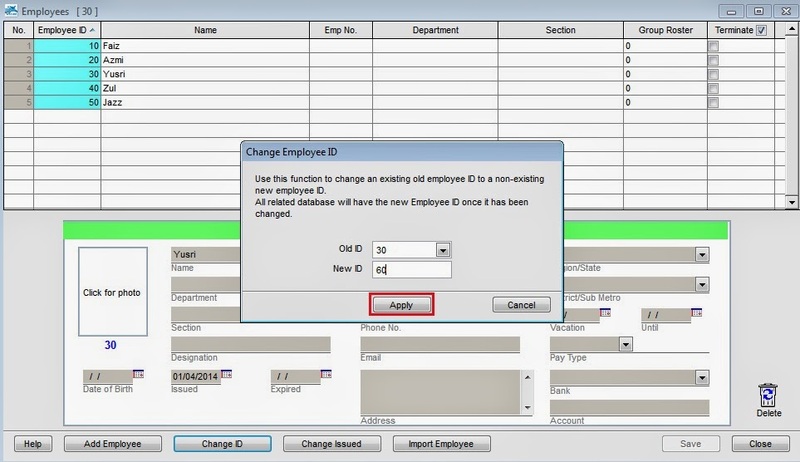 TCMS V2 allows you to change the employee ID to match with your requirements. However, your need to make sure that the same changes are made in TCMS V2 AND the corresponding hardware to avoid any complications after the changes. Please perform complete data download from all devices to collect all transaction records before you start the process of changing any Employee ID. Step 1: Download all transactions and users into TCMSv2 software. 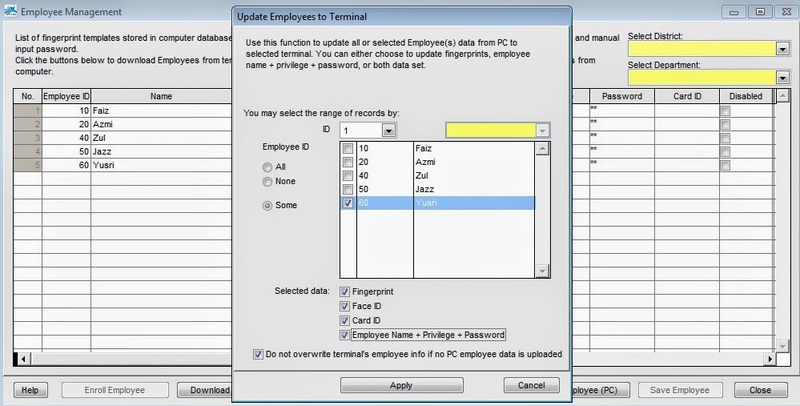 Step 3: Perform a check at all devices to make sure the employee data was deleted from all the devices. Go into Terminal User Control à Check employees > Download Employees > Apply > OK > Check the list to make user the old employee ID is no longer exist in all devices. While changing Employee ID in all devices are okay, an important thing to avoid is the mismatch of information between TCMS V2 and the hardware. If we change the user id is there a chance that we can transfer/view their old attendance record to their new user id? When you change ID, all attendance record & user data in TCMSv2 will directly changed to new user ID. any help? or guide me to a proper forum for this issue. Please provide us the backup database file and send to support@fingertec.com for further checking. Also informed us the old ID and new ID. Regards. How do I add a new employee and fingerprint? Is there a step by step guide? You can enroll new employee at the TCMSv2 software > Employee Icon > Add Employee and then go to the devices > employee management > enroll employee , to enroll the fingerprint. You can also refer http://www.fingertec.com/customer/download/postsales/SUM-TCMSV2-E.pdf at page 72-75 for more detail about the employee management. If there is any other information required, do let know so I may assist you accordingly. I have a list of enrolled users, how to differentiate between enrolled users using card id or finger print or username and password? is there any report that can assist or even any query or form? For TCMSv2 Software, you can preview Terminal Employee List report. It will show Employee ID, Employee Name, Name, User privilege, Card Number and Total Finger. can i know how to delete all data at finger tech data terminal. For Black and white devices, Please press Menu > Option > System option > Advance option > Clear all data. For Color screen devices, Please press Menu > System > Data Management > Delete all. If devices is locked (Admin Affirm), Please enter the Menu using Supervisor/Superadmin Privilege because only them have authority to delete all data in devices. hi, I want to change a user ID but its not allowing me to change it to a previously used number. I had an employee with ID 3 that was deleted months ago but for some reason I cant seem to use that ID anymore. any help would be appreciated. Referring to the problem, please make sure you have completely delete the user ID 3 from the TCMSv2 software before you can reuse the user ID. You can check it by go to Employees tab > tick right on Terminate option, and check whether the user ID 3 still there or not. If still there, please delete the ID, then follow the above step to change the user ID and reuse ID 3. Regards. macam mana nak tukar versi pada mesin zkteco f8?? We are sorry to inform you that we do not support any ZKTeco devices. Kindly look for the correct provider to support you on this matter. Thank you. Referring to your query, kindly brief us whether you fail to remove all the user data including the User ID, privilege, password and name, or you only fail to remove the fingerprint template. Basically if you wish to transfer user data from one terminal to other terminal, you may refer the step and procedure from the following manual (Chapter 4, page 48-81). In the mean time, please make sure that the second terminal terminal have the same Alg version (Fingerprint template version) like the first machine, before you can transfer the fingerprint template successfully. Thanks and regards. I need a help regarding on how to remove the user's enrolled password. Referring to your query, you can remove the user enrolled password through the TCMSv2 software. Open the TCMSv2 software and go to Devices > Employee Management > Edit or Delete user password on Password column, then update the new info to the terminal (Update Employee > select Terminal ID > select User > tick on selected data (Employee Name+Privelege+Password) > Apply. Once finished, please restart your terminal and check the status of enrolled password. Thanks and Regards. salam sejahtera, macam mana nak access lebih dari satu tempat. contoh staff ditukarkan ke branch lain. Merujuk perkara di atas, sila jelaskan lebih lanjut tentang maklumat yang tuan/puan perlukan, supaya kami lebih faham. Tuan/Puan boleh hubungi kami di talian 03-8070 9933 (Technical Support) atau email support@fingertec.com. Sekian harap maklum. I need to copy users from the TCMS to a new device. How can I do that? It's not working. Even though I get "Process Completed" message in TCMS V2. I also went through the manual and followed each step; the fingerprints are not being uploaded. We're talking about 80 fp. We suspect that fingerprint from the TCMSv2 software is different algorithm from the new device. Fingerprint templates from the BioBridge VX10.0 algorithm cannot be mixed and matched with fingerprint templates from BioBridgeVX9.0 algorithm. The templates derived from the BioBridge VX9.0 will prompt an error during the verification period if it were uploaded to the terminal via the BioBridge VX10.0 or vice versa. Incase both old device and new device is using different version, you need to downgrade or upgrade the biobridge version of the new device accordingly by using the Function tool so that it will have the same biobridge version like the old device. Im trying to enter in a password for a current employee since his fingerprints are not legible. I've done the steps at the terminal but it wont save. What am I doing wrong? 1. What terminal are you using? 2. Do you mean that after saving the password, the user cannot verify using password? Also, please try to create the password in TCMS v2 and upload it to the device using 'Update Employee' function and monitor the result. If the problem persists, you may send us an email to support@fingertec.com together with the above information. hi .Can i add new fingerprint's employee from fingerprint device to anther fingerprint device by PC. Referring to your query, yes you can manage your fingerprint template from one device to another device from the TCMSv2 software. For details step, you can refer to the TCMSv2 manual page 50. It will show you how to download and upload user data from terminal to the software and vice versa. Please see comment posted on November 22, 2016 by Husna Ahmadjuani. It's very important the check the Fingerprint template algorithm used by each device. If they aren't the same, you won't able to upload the fp to the new device. Regarding to your query, you can refer to the user guide or manual for TCMSv2 software from below link (refer chapter 5, page 72-75).